According to Deadline, many members of the transgender community have questioned the casting of a cis-male actor for the role. Executive producer Mark Ruffalo says he wanted Bomer for the part after a “profound experience” working with him on HBO’s production of The Normal Heart. The story involves a man named Early Landry (played by John Carroll Lynch) who moves to Los Angeles after his wife passes away to live with his overly protective sister (Maura Tierney). He eventually flees in Hollywood to get away from her. 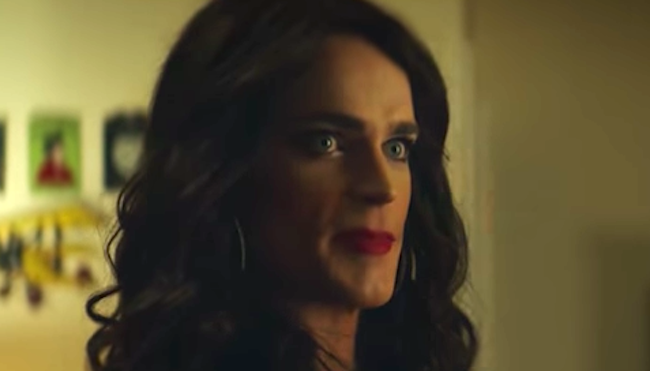 Confected controversy aside… Matt Bomer as a guy = 10; Matt Bomer as a girl = 3. Discuss. HE, has no experience as transgender, typical Hollywood discrimination. Isn’t that the primary reason it’s called “acting”? I know people say that’s what acting is about but man his acting is lousy in that scene. If this movie proves anything, it is that being a gorgeous man doesn’t necessarily mean that you can transform into a gorgeous woman.